I met high and low seas during first year of my voyage. 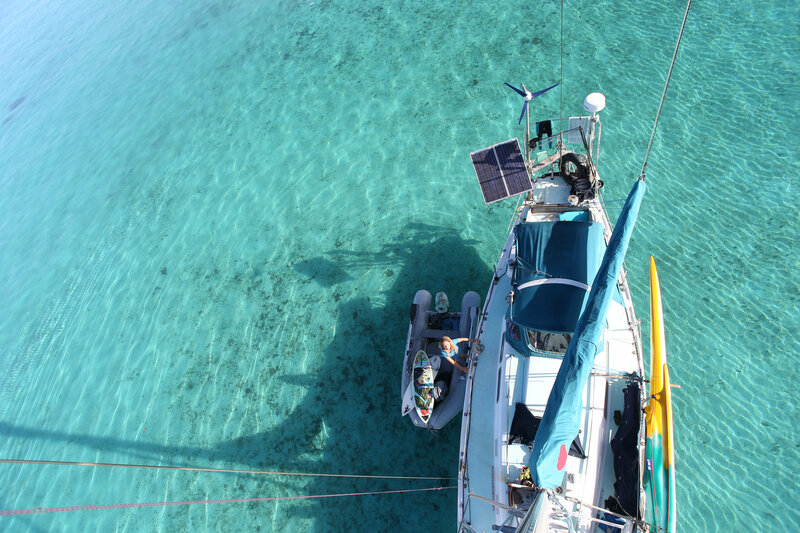 Sailing to find surf was exhilarating, but I spent much of my time wracking my brain about how to stay financially afloat. People often wonder how I manage monetarily. Many suppose I’m some sort of trust fund kid. I wish that were true! But truly, every dollar spent since leaving the dock has come from my own efforts. That was the original deal I made with my mentor and sponsor, the late Dr. Barry Schulyer. Barry agreed to prepare Swell for the high seas, but I would have to fend for myself financially once the voyage began. My travels on Swell as a young, female captain earned me considerable attention during my first year of sailing. Covers on adventure magazines like National Geographic Adventure, feature articles in Foam and Wend, shoutouts in Outside, and the opportunity to write monthly columns for Surfing and Latitude 38. In hopes of not draining my savings too quickly, I composed articles and blog posts in a frenzy. I invited adventurous friends as crew who could double as amateur photographers in hopes of attracting sponsors. Every site on the coast of Central America with internet became a happy port of call in my mania to network, produce, and trawl for additional income. But a year after I sailed away from California, I ran fiscally aground. My only stable sponsor stopped sending money. I panicked. I felt defeated. The window to cross the Pacific had already begun. I kept busy between repairs to Swell in Panama City and writing emails at TGIFridays hoping for new sponsorships. An underlying dread about my finances persisted. A month later, I woke on the cabin sole amidst scattered tools. I began to re-think the entire enterprise, stem to stern. What did I want from this voyage? Why was I really doing this? These unsettling questions flopped around in my mind like a luffing jib. I realized I had been moving and working at an unsustainable rate for almost two years in an attempt to keep my ‘followers’ entertained. I thought people would get bored and lose interest in my enterprise if I didn’t sail quickly enough to ever-new destinations. I was shaping my whole trip around assumptions about what other people wanted. So I took a deep breath and embraced an actual change in course. I decided to slow down, try to let go of financial anxiety, and really do what I wanted while my savings lasted. While other sailors were choosing to speed across the greatest expanse of ocean on the planet, I decided to let myself enjoy a few of the first south swells of the season in the islands off Panama. 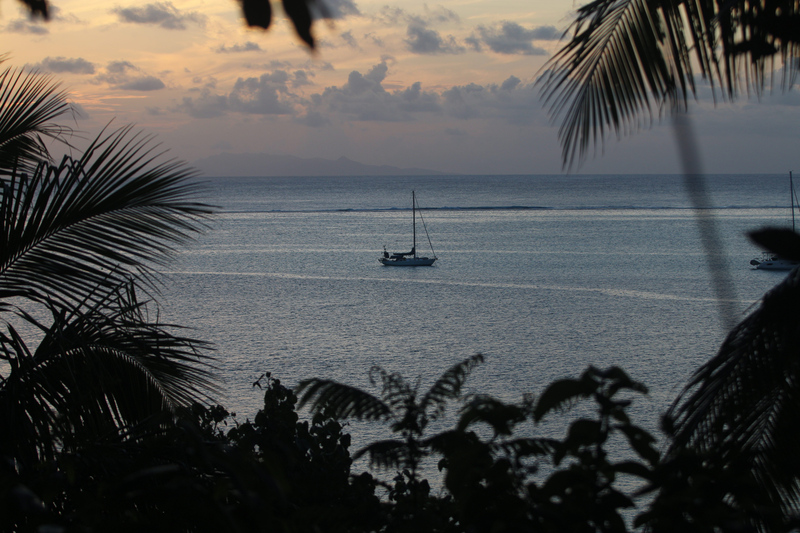 Then, at my own pace, I set off toward the South Pacific late in the season of 2007. Upon arrival, I decided to take more time to explore. I stopped worrying about having a photographer with me and started to love sailing solo. Traveling without a lot of money pushed me to connect with more people, use local transportation, waste less, and become more resourceful. Instead of passages planned around scheduled pick-ups for crew, I tuned into my own intuition about when and where to sail. I went remote, didn’t panic about needing an internet connection, and kept writing blogs because I love writing blogs. New places, cultures, and the enthralling natural world around me urged me to stay present, showing me that money doesn’t always have to be first priority. I learned so much. I had more time for simple joys like photography, fishing, cooking, and learning from local people. My savings dwindled, but I felt richer. I became more generous, more compassionate, more confident. I had more time to discover who I was. Just when I imagined I’d have to pack up and head home to work to fix a problem with Swell’s hull, private donations began trickling in, sponsors started contacting me, and I was even offered payment for my blogs. I saw that my real value lay in my allegiance to my own dreams and desires. My voyage and life took on more meaning as I challenged myself to maintain the faith and fearlessness to prioritize what felt valuable to me: Freedom to surf and adventure. Time to dedicate to environmental issues and awareness. And time to help people along the way. Now more than ever there are so many unique ways to make a living doing what you love. Despite what I might make it look like on social media, I work hard every day to keep this lifestyle going. I am lucky enough to work with some of the most wonderful, environmentally-dedicated companies in the world now, including Patagonia, Avasol, Mizu, Eco Flex, Firewire Surfboards, Zeal Optics, and Wave Tribe. Plus collaborate with a variety of non-profit organizations like Changing Tides Foundation, 9 For 17 (vegan awareness), Beyond the Surface International, and Boarding for Breast Cancer. I’m also finishing up that book I’ve been promising! I’m not putting away any savings for retirement yet, but I’m living in my values and doing work I believe in. Whenever I doubt myself and my future, I try to remember this lesson. I tell myself to stop doubting and stay true to myself, because, although it may not appear so at first, therein lies our greatest abundance. It’s not easy to do in today’s world, but we must remind ourselves that we have the power to choose where and how we spend our energy, and that when we persistently align ourselves with our deepest callings and desires, we can attract what is needed to do what we really want to do. When we live from heartspace, there is always a way. Turning away from the ‘security’ of a job we don’t love or a situation that no longer suits us is a scary leap, but there is so much to gain when we prioritize our personal values and happiness. So in this new year, I will strive to trust my heart and give myself the liberty to choose again, and choose differently, according to what feels right. And I hope that you will too. P.S. Book comes out March 2018! “I saw that my real value lay in my allegiance to my own dreams and desires.” So simple and so powerful. That’s why I love the Swell blog. I couldn’t agree more with the power of the quote Kevin cited. Great job, Liz. Stay wild! Thank you for this timely post. I’m on my sixth year of cruising (now in South Africa) and heading back, with a great deal of uncertainty to the USA to find gainful employment. My passion is not of the sort that is easily monetised, and I’ve learned to do things i can tolerate but don’t love, to make ends meet. I may yet have to continue that for a while, (kids need family and stable friends) but your message resonated deeply with me, and may be the catalyst I needed for a change in professional trajectory. From a long sail ,and a cup of coffee and chocolate. Don’t rush it. Baby steps,keep it simple,I wish you the best,stay safe. Love your blog, can’t wait for your book! So glad you are still doing it out there. Love your style in writing and your surfing is world class. I am really happy to have helped a little when you had the shaft leak. Still haven’t given up on the possibility of anchoring in the same bay as you someday. Stay feral. Hi Liz ! Keep up the good work, keep spreading the word ! I live on Cape Cod, a decent sized peninsula off of Massachusetts. Starting in 2016, town by town, county by county, we’re BANNING PLASTIC BAGS HERE ! I know, right ?!?!?! Very exciting ! We see whales from shore spring through fall, have recently become a great white shark hot spot, probably due to rising sea temperatures. Scientists have been tagging now for about 3 years and are getting some amazing tracking results. We also ): unfortunately see our share of autumn dolphin and turtle strandings. We’ve got an excellent facility to rehabilitate the turtles, most of them are transported by van to Florida and released when they’re healthy enough. Maybe we’ll see you here someday for a visit, with or without the Swell ! Wishing you and kitty all the best and steady fair winds at your stern, wherever you go ! Wonderfully put Liz. Beyond all the sailing metaphors some great lessons learned we can apply to our many different types of lives. Sail onwards! F’ YEAH! Sista! I love this post because I have been there and returned and sometimes have had to learn/learning still learning this lesson daily. You’ve a richness in purpose few achieve. You’re a beacon, doing this – and your light rings true halfway around the world, and even to old guys at desks. You have been, and continue to be, such an amazing inspiration to my family and countless others out there across the world. You are a beautiful, adventurous and brave soul. We sailed for a year and a small and very simple boat in the Sea of Cortez with a 4 legged kid and plan to do some major life changes soon to keep adventuring, this time adding our new two legged kid. Thank you for being you, Liz! I follow you and Tropicat on Instagram and I thank you today for giving me the power to dare to dream. Sending great vibes your way from New York City! Great post, Liz. In our family’s travels under sail, we definitely agree on the slowing down part. Cruising at our own pace and in our own place — and not through the expectations of others — allows us to live everyday in the moment a little bit more, enjoying each other and the world around us to the fullest. Cheers from SV Yahtzee! Beautifully articulated … We throw off the dock lines 2018 and the sacrafices we are making now to fuel our dreams are validated by voices like yours. May our paths cross in real time someday. Warm congratulations Liz on the life you have chosen and are sticking to. You are a real beacon for those of us who are “arm chair travelers” tied to desk bound jobs, mortgages and family responsibilities. You remind me of Tony Herrick and his wife who did three circumnavigations in yachts they called ” Wanderer” ( 1 – 5), after finally settling in New Zealand. He also wrote many interesting books, detailing their passages and adventures. Have you thought of joining “sailblogs.com”? That may help you to get a bit more publicity. We appreciate you sharing your journey, adventures and beautiful photos with us! May you be blessed with “fair winds and gentle seas”. Keep up the good work, and we are looking forward to hearing and seeing, more from you! I think you are referring to the Hiscocks, I happen to be reading their book written about voyaging on Wanderer IV. Liz, your blog and pictures leave me speechless! Thanks for sharing your unforgettable experience! its really inspiring how you live on the sea! 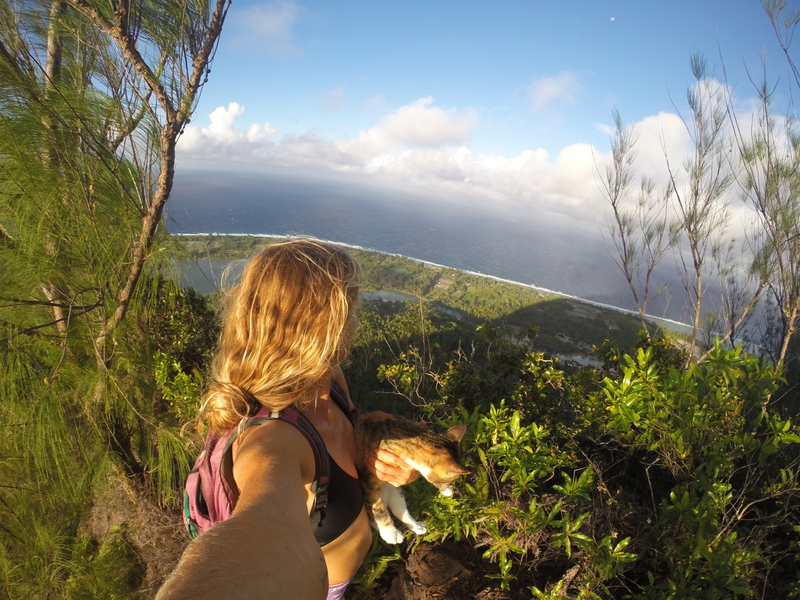 I love cats and it is amazing to see how your cat travels with you! What is the secret that she does not escape during exploring new places? Hey! Glad to see new posts since last time I clicked your bookmark. You are so inspiring, thank you for being you! How would you summarize the comparison of a board such as an Aquatic Oddities Eco-Flex surfboards verse a traditional fiberglass/standard surfboard? Also curious if you have ridden anything larger in size from Aquatic Oddities, like a 7 to 8 foot fun board, or 7 to 8 foot all around take anywhere board? Hi Michelle. 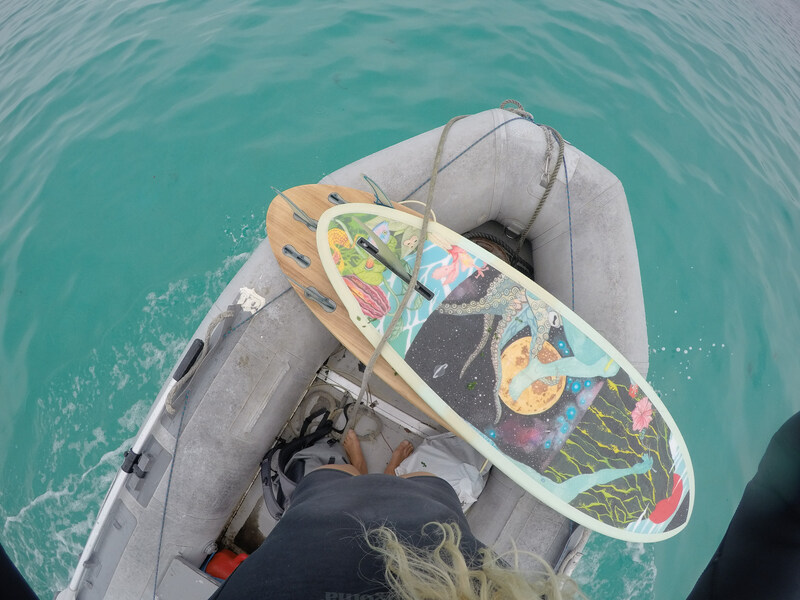 In general, epoxy boards will float more than traditional surfboards. This often makes them easier to ride because they are easier to paddle and catch waves. I find them to be lighter and more responsive as well. Durability!!! They will outlast a poly board by at least 3 to four times. AO boards are super light and ultra high performance. I’m sure Jake could make you a fun board, hit him up!! cool feeling getting a new board, seriously. I always looked forward to it. or even a benefit without it? How about chocolate (vegan, of course!)? Such a natural way of expressing one’s thought!! good wishes from Bangladesh! Once you let go, and begin to ‘give’ without concern for receipts, then you indeed begin to receive. I LOVE this poem!! Thank you!! I love reading your blogs and admire what you do. In a few weeks I’ll be taking my first sail to upstate NY from Fl. I am new to sailing, however my partner knows so I will learn along the way! I am super stoked. Are there any tips you can suggest like food to bring, or anything that helps along the way. I’m wondering how we will keep veggies from going bad, without having to buy ice etc. Would love to here your thoughts! Thank you for being you the world needs it!! Absolutely LOVE that quote! And well done for securing those sponsors and articles. It’s all down to you, it wasn’t luck. We love your mission and lifestyle. We’re setting off in less than a month to pursue a very similar life (without the pro surfing and sponsors :P). We’ll work freelance from our laptops to stay afloat. We hope to live half as intensely as you do Liz. I am inspired by your strength, purpose and cat. Your cat (well cats own you, actually, so NOT yours) drew me in to following your journey originally. I’ll read that book. Come to Chico for a signing. Or Maine. Fill your heart. People like you encouraged me to quit the job I hated, sell everything and take a huge leap to live life the way I want and not the way I am told. I must say I am scsred to death. I am scared of not making enough to meet my budget. My plan is to charter so I can share the wonder and beauty with others. Being a solo sailor I think the company will be a good thing. I am also taking my TIG Stainless Welder, benders and cutters in hope of finding those that could use my service. One problem I know I must face is the politics of not legally working in foreign countries. Too bad we can not escape big brother anywhere in the world. I am just going to take the chance of working anyplace and anywhere hoping no one will report me. People encourage me and say I have to folliw my dream or if I dont I will live thinking “What if”. I am diving in with both feet, scared to death but scared more of working my life away instead of living my life. Thank you for being another inspiration. Lovely post Liz. It resonates with me a lot and I guess it represents much of the feelings of our little community of free souls.